Earlier this week, NASA’s Cassini spacecraft took its deepest dive ever through the center of the icy plume shooting out from the southern pole of Saturn’s moon Enceladus. NASA reports that the spacecraft survived Monday’s flyby in good health, and is now transmitting eagerly awaited data and images back to Earth. At its closest point, Cassini dipped just 60 miles above the surface of Enceladus. Although previous flybys have gotten even closer, this trip included the spacecraft’s deepest foray into the south polar plume, which was discovered in 2005 and is known to contain water vapor, sodium and organic molecules. As Cassini gathers more and more information about the composition and density of the plume, scientists hope they’ll be able to identify the source of the gas. If the source is a liquid ocean underneath Enceladus’ icy crust, it could harbor life if conditions are right. To fly through the plume safely, however, mission managers had to conduct extensive pre-trip studies and make sure the spacecraft didn’t use too much propellant. Cassini captured the unprocessed image above using its narrow-angle camera at a distance of about 120,000 miles away from the moon. 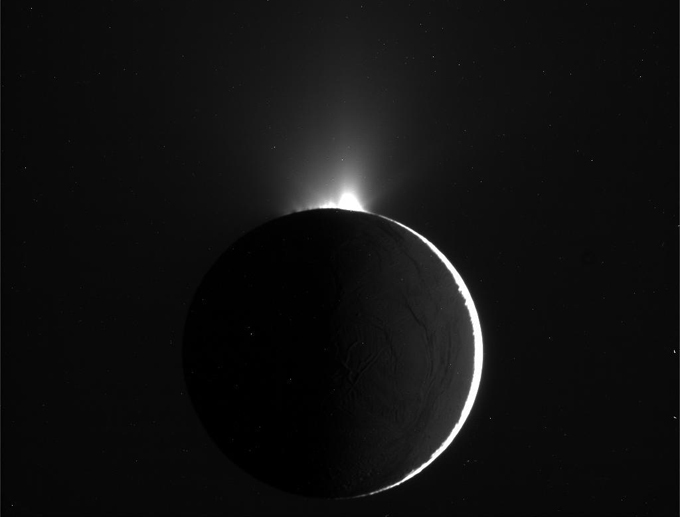 As sunlight bounces off the moon’s crescent edge, it highlights the mysterious misty plume at the southern pole.